Education is an important tool for breaking the cycle of poverty. However, the Rooigrond Early Learning Centre not only ensures that the children receive access to early education; but through the lifeskills element in the curriculum, it also ensures that they learn their value. They are encouraged to believe in their dreams, in themselves and their abilities. This serves to create a sense of self-determination in them from a young age, allowing them to know that their respective circumstances do not make them any less valuable. All too often we see many young adults in Rooigrond who allow poverty to undermine their sense of worth, something we are changing. Losing one’s home is a painful experience, but losing it at the hand of someone you love, is much more worse. This was what a family of eight went through, earlier this year. It all started with a pair of sneakers requested by one of the children, his parents assured him that he would receive a pair on Friday, when his father- a farm worker would receive his wages. Alas, the farmer for whom he worked did not pay his workers that day, but assured his workers that they would be paid the following day. Little did anyone know what horror would come from his inability to pay his workers that day. The young man asked for money for his sneakers that very evening. His father explained the situation to him, but reassured him that he would receive the money the following day. The young man stormed out livid and did not go home that night. Upon his return, the following day, the young man found the family home empty. He poured paraffin all over and set the house alight. In that single moment, the family lost not only their home, but everything they possessed, even their Identity Documents, school uniforms, everything. The young man was arrested for arson, which caused further stress for the family. No parent wants their child in jail, especially not at their hand. Upon hearing about the family’s situation, we acted to solve the immediate problem, shelter. An entire family, more so with such young children in the household, could not be left homeless. 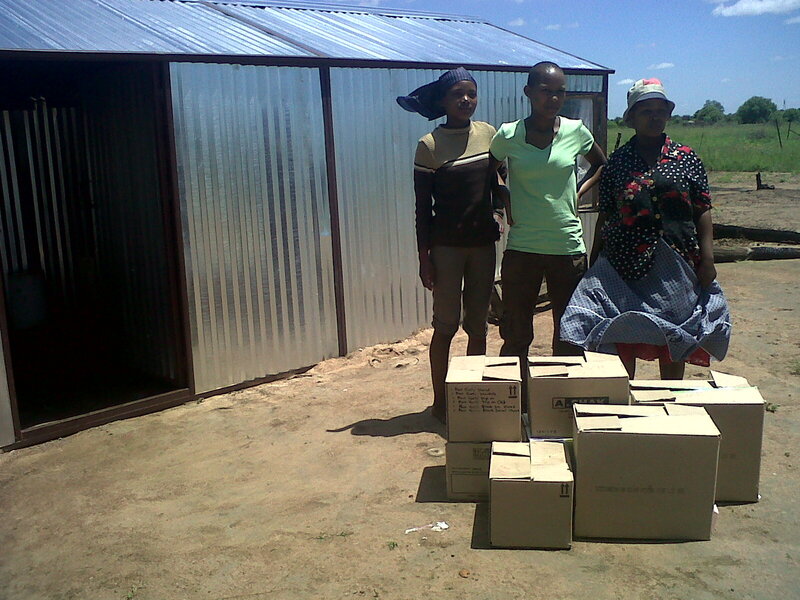 The Local Municipality heeded our pleas and provided a ‘disaster shelter’ for the family to use for six months. With the most immediate problem solved, we could now step to the next, clothing. Operation Blanket, a Mafikeng based NPO and Project: LAYLA, a programme under their administration were informed of the situation and opened their doors to us. Members of our team, along with Operation Blanket staff sorted clothing for the family, making sure to male their parcels as suitable as possible, including uniforms, school shoes, jerseys and so much more. 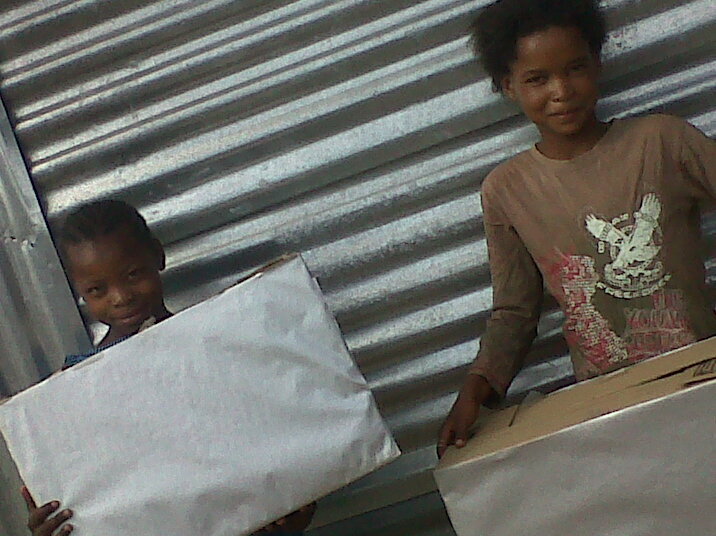 These parcels were handed to the family, who received so much comfort from the kindness shown to them. Once more, generosity and kindness, brought hope in what seemed to be a hopeless situation. Very often interventions in areas like the Rooigrond Informal Settlement are unsuccessful, due to a failure to take into account the contexts of such areas. The challenges faced there are very different from what the average person faces daily. Overcrowding, going long distances for water; poor, if any, sanitation; amongst many more are the reality of many people in rural contexts. We meet these realities daily, but never has one hit home like the ‘cow incident’ earlier this year. One evening, shortly after midnight, a knock came to our door and we were informed that a cow had fallen into a toilet. The Fire Brigade was called and believing it to be a hoax, they failed to act. The police had no interest in assisting, which left it up to the community to ensure that this animal was safely removed. 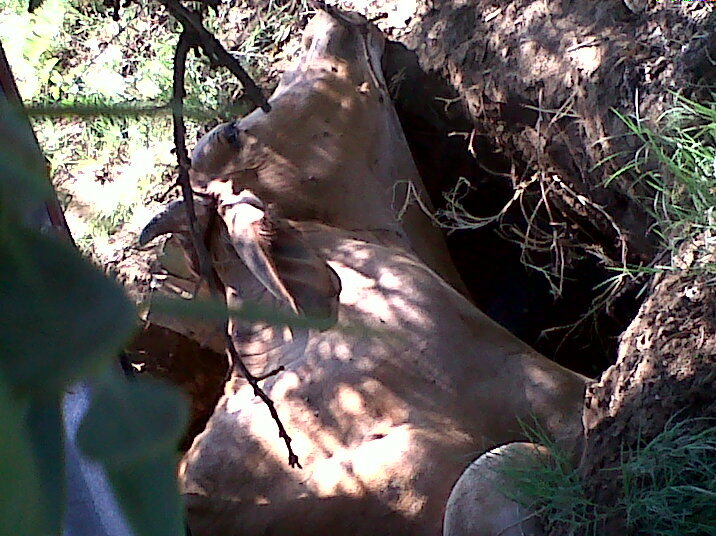 Fearing broken limbs, a plan was made to dig a trench around the cow , so as to not have to pull it, thereby causing it more distress. This was successfully done. The above scenario is something that many, if any person in an urban situation would ever go through. It’s such challenges that need to be understood, in order to understand the rural contexts. Some things we never dream possible, are the daily realities of others. Imagine waking up to the sounds of heavy rain falling against your home and accompanied by terrible lightning, thunder and wind. Whilst listening to it, your roof flies. All you can do is grab your children and lay low, lest the flying corrugated iron sheets that are flying around hurt anyone. You watch helplessly as everything you own is swept away. As the water rises, you realise the need to flee your home. Sounds like something from a nightmare, right…? Well, it was a reality experienced by 40 families in the Rooigrond Informal Settlement. Earlier in the year, at 23h00 we heard a knock at the door. It came as a suprise since there was very heavy rainfall outside and we opened to find a woman and her 3 soaking wet kids. As they entered we heard the chilling tale of how their shack was swept away by the rain. As we got the children dry and into fresh clothes, more knocks came from the door. We all moved to the Early Learning Centre, as that was the only place that could accommodate everyone. In that single night, 40 families had lost everything. We sent out SOS messages immediately. The following day, the community came together and assisted to rebuild the shacks which were destroyed. Poles & corrugated iron sheets which had been swept away by the water were found and reused. The Lutheran Ladies of Lomanyaneng, who had also received a SOS alert were quick to respond and on the 06th January 2011, we successfully co-ordinated an outreach for them in which they gathered in Rooigrond bringing along with them much needed clothes and food for the affected families. Our will power combined with the kindness of others has ensured that our Daily Feeding Program continues successfully. We believe that, no child should ever have to go hungry, when there is enough food in the world for us all. 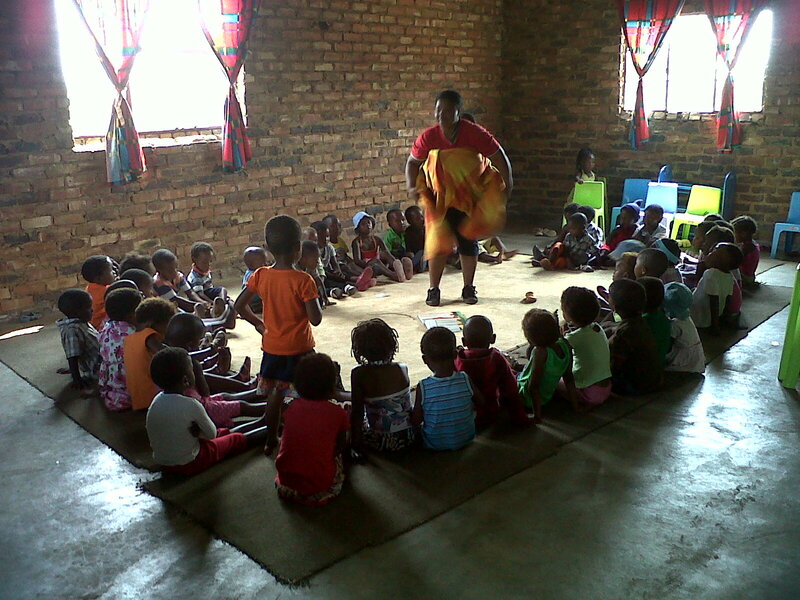 2011 saw our beneficiaries increasing from 483 kiddies to 556 kiddies. Though not an easy task, with challenges being met often, the Daily Feeding Program has become central to our operations. The knowledge that this is the only meal that most of these children have each day, is not always easy, but has becoming quite a driving force for us. Playing a part in ending hunger in Rooigrond, not only brings great joy to us, but can make the difference between life and death for these children. Hunger can drive humans into doing things that no person, more so a child, should ever have to do- something that we can all play a part in eradicating. The Rooigrond Informal Settlement in which our operations run is 17kms away from the nearest town, Mafikeng. It has no clinic, police station and even a need as basic as water is a problem. The entire settlement has only two Engine run water pumps, meaning that some are forced to go long distances for water. However, despite all the difficulties and hardships faced by the community, they are active participants in the move for positive change. Volunteers gladly assist with the collection of the water required to cook for our Daily Feeding Program and often assist our team with the cleaning of the centre. The hope they have within, despite the circumstances they face on a daily basis, is enough inspiration to overcome challenges we meet daily. This community, with their hopes, dreams and willingness to be empowered embody everything we stand for- overcoming. 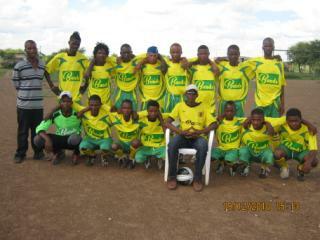 With the fine young men making up the Golden Stars F.C team honoured, their journey in inspiring and creating a legacy for the youth of the Rooigrond Informal Settlement continued. Challenges continued to be bravely faced, till light showed itself in the form of an act of kindness from Bonds Sports and Leisure, in the form of sponsorship for a new kit and ball. Through this act of kindness, our boys were once more ready to face the world and continue their journey of creating a legacy for the youth of the Rooigrond Informal Settlement Area. The hope that a single act of kindness and generosity can bring, is very remarkable, hence the ability of kindness to change the world. Very often, the real victims of the HIV/AIDS pandemic are forgotten, immediately after their parents are buried. But often what is left, are innocent children left to fend for themselves or are added into households, which have no room for more. It’s made even worse by the fact that, many of these children had to care for their sick parent/s on their own, watching them die and the torn emotions that come with that death. The sorrow of losing a parent is never an easy thing to endure, more so for children; this coupled with fear about the future and guilt that comes with the relief the death brings for those who’ve had to care for their parents for extended periods, is enough to haunt any child.